After quite the haiatus, managed to crank out some ASM over the weekend and the space levels are nearing fruition! Lil bit of tinkering left in space but I've planned out the underwater levels tonight. 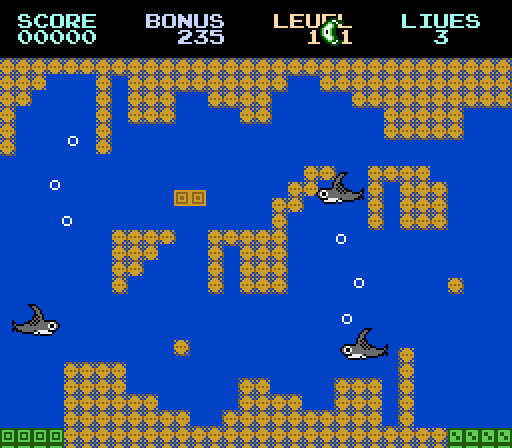 Got the underwater levels set-out a bit more in FCEUX and a love how cute the sharks loo currently. Just need to add more to their movement patterns andthen I'll be pretty happy with it! Starting to make the sharks move more like...err guppies in the fish tank... still deadly mind! Will add some light homing to one of them to mix things up. Apologies for the delay in updates, been busy with bits and bobs all over the place with work, family and, thankfully found some more time for some work on Flap Happy over the weekend! So, I've set out the instruction booklet and designed a simple, fun little logo for the game. Have written up a handy sound effects and music chunks of code recently. I need to make improvements to both but at least they're working fairly well so far. Finished up writing up my music engine recently, quite pleased with the results so far, just need to tidy up the game, sort out the ending and I'll FINALLY be done! Made a bunch of fixes, added a roulette style fruit system to quickly garner extra points to earn extra lives, few more bug fixes, more music tracks and an ending then it'll be done! Handling high scores now, a bunch of bug fixes made, just under 8kb left to go for coding up the ending, more game audio and the layout of the single stage select mode. This'll be interesting as it closes down to completion. So, I also need to ensure a good difficulty curve, spent a bit of time over the last couple of days assigning difficulty ratings ( 0-10) to the stages, whch, of course, means playtesting each one and noting it down. It's a time consuming process but I'm ~40% complete with 416 / 1024 levels rated, duplicates removed during the process. Haven't found an impossible level yet, which is a relief as that could change everything. Also, added visible ceiling spikes to each level to make it more obvious that the player can't just flap away through the top of the level itself.